What was your favorite cereal when you were younger? 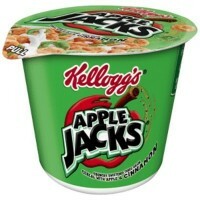 Kellogg's Apple Jacks Cereal has been an American favorite for both the young and young at heart for many years. 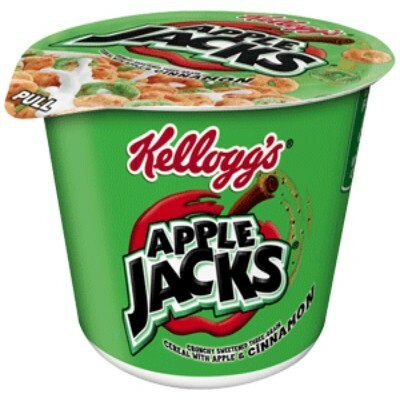 Now you can enjoy the crisp apple and cinnamon flavor again with an Apple Jack's Cereal Cup. Each 1.5oz cup is full of sweet, whole grain goodness. It's the perfect on the go snack or breakfast! Sugar, corn flour blend (whole grain yellow corn flour, degerminated yellow corn flour), wheat flour, whole grain oat flour, oat fiber, soluble corn fiber, 2% or less of: partially hydrogenated vegetable oil (coconut, soybean and/or cottonseed), salt, milled corn, dried apples, apple juice concentrate, corn starch, cinnamon, modified corn starch, colors E110*-E100ii-E133-E129*, acidity regulator E500ii, natural flavor, antioxidant E321 to preserve freshness, vitamins C-B3-B6-B2-B1-A-B9-D-B12, reduced iron, zinc oxide. *May have an adverse effect on activity and attention in children. Contains GMO. Nutrition facts (for 100g): calories 381Kcal, total fat 3.6g (saturated fat 2.4g), total carbohydrate 88.1g (sugar 42.9g), protein 4.8g, salt 1.2g.